Long-lasting and economic. A slim laptop featuring a Haswell processor for 499 Euros (~$671) doesn't sound bad at all. Our test report reveals whether the Pavilion can stand out from the innumerable contenders. There are countless, affordable office laptops in a 15.6-inch format. 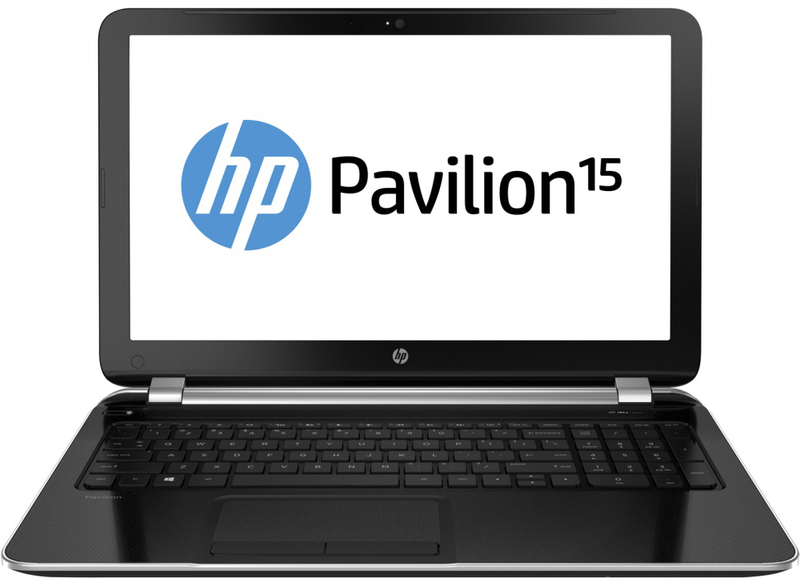 Hewlett Packard expands its range by another device with the Pavilion 15-n005sg. 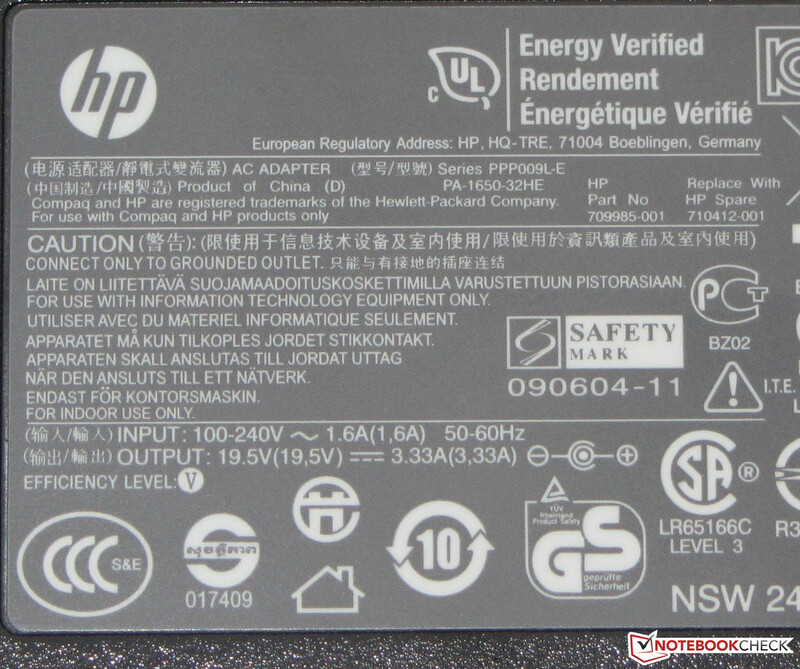 The installed Haswell ULV processor indicates that it is an energy-efficient and long-running laptop. We will find out whether this is true in our test report. We used Lenovo's G505s (AMD A10-5750M; Radeon HD 8650G + HD 8570M Dual Graphics) and Acer's Aspire E1-572 (Core i3-4010U; HD Graphics 4400) for classifying the laptop. The Pavilion's casing is completely made of plastic. The laptop has that in common with both the Aspire and G505s. The same colors and patterns are used in this Pavilion as in the Pavilion 15-e052sg and Pavilion 17-e054sg. The display bezel and base unit's upper side are black. The latter is additionally covered to about three-quarters with lighter-colored dots. 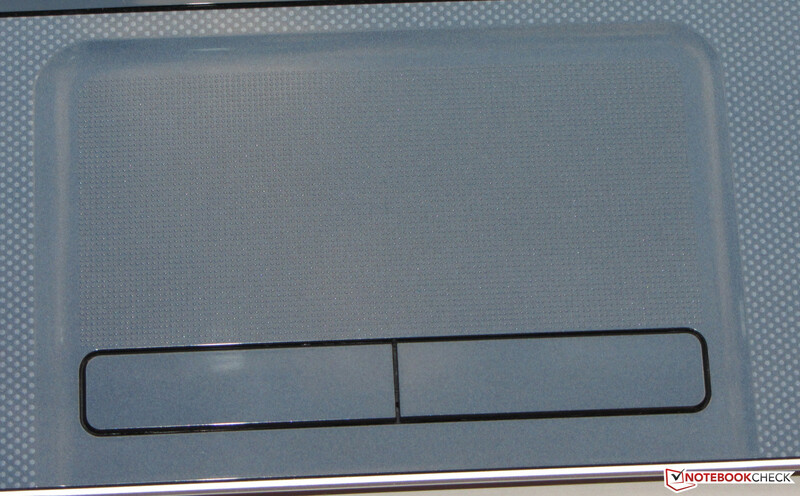 The display's back shines in silver-gray and also features tiny dots printed in a darker gray. All surfaces except the underside are glossy. 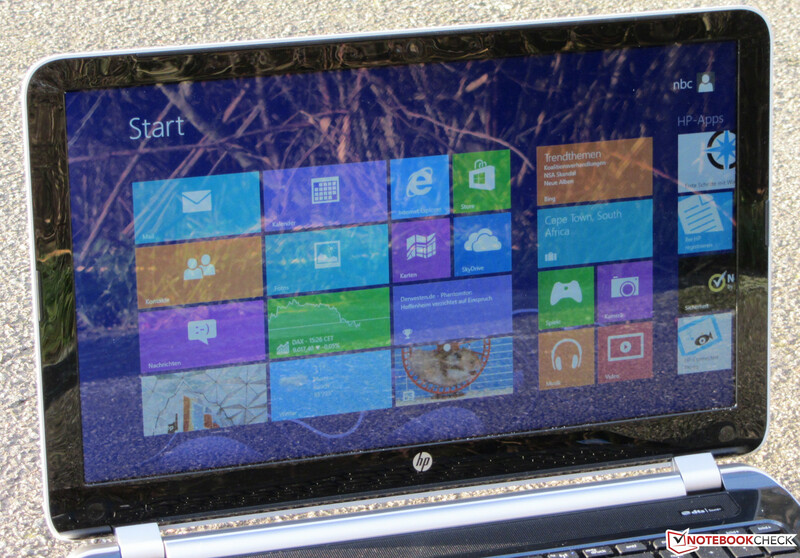 HP accordingly names the casing's color "Sparkling Black". The base unit makes a sturdy impression. 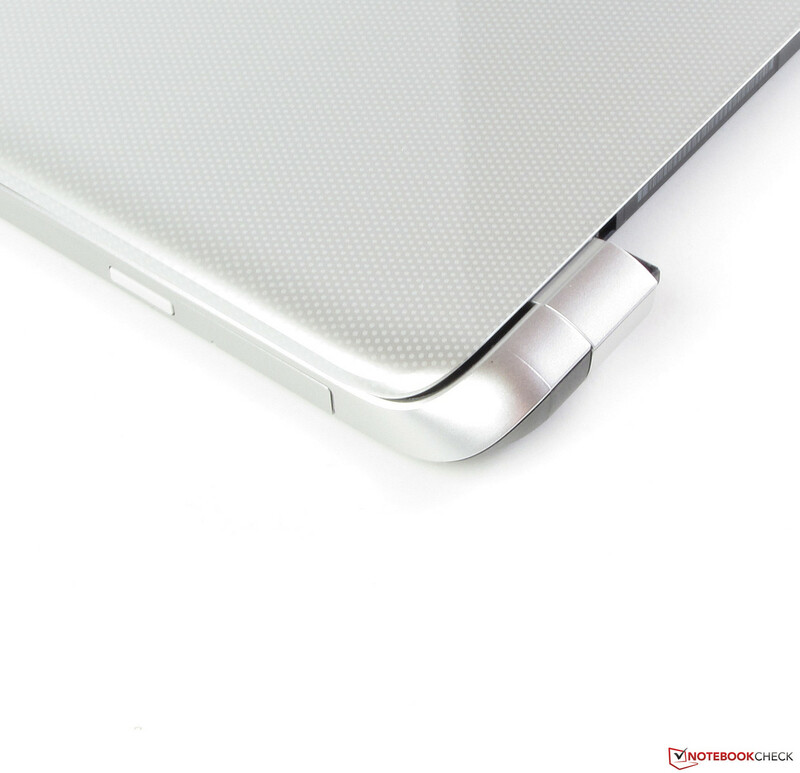 It does not exhibit any major weaknesses and its stiffness is adequate for a budget laptop. The lid can be warped to a slightly larger extent and pressure on its back causes image distortions. The hinges keep the lid firmly in position, but wobble a bit. It is possible to open the lid with one hand. There is only one small maintenance cover. All three comparison laptops feature the standard ports found nowadays. 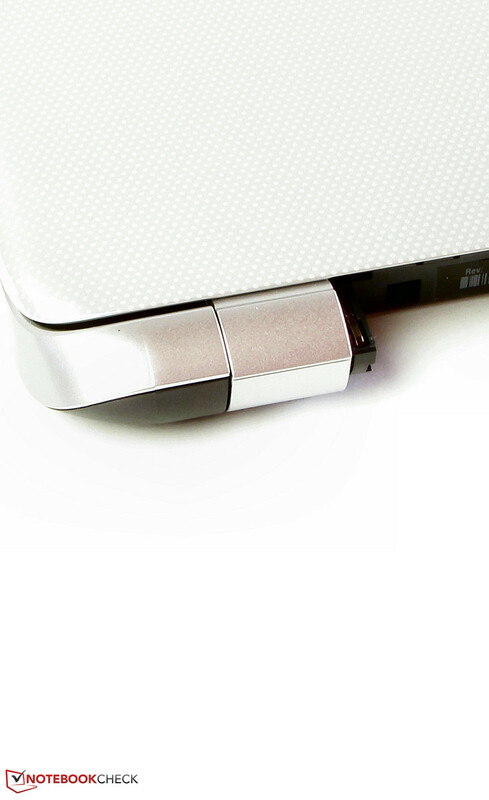 Every laptop has at least one USB 3.0 port. The Pavilion does not sport a VGA out and an HDMI-to-VGA adapter (approx. 20 Euros, ~$26) would have to be used when required. Only the Aspire offers Gigabit Ethernet. Both the Pavilion and the G505s only feature Fast Ethernet, which is no longer contemporary. The Pavilion's interface positioning is unfavorable. Most ports are on a level with the wrist rest. Realtek's RTL8188EE Wi-Fi module supports the 802.11 b/g/n standards. We did not experience any problems with Wi-Fi reception. The connection remained stable both in the router's direct vicinity as well as at a distance of approximately 15 meters. However, this is not a standardized test. HP installs a Fast Ethernet chip from Realtek's RTL8102E family for LAN connections. 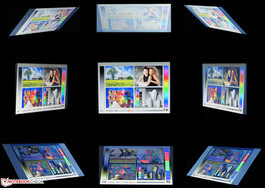 The built-in webcam produces a muddy picture in a resolution of up to 1280x720 pixels. Apart from a quick-start poster and brief instructions for Windows 8, there are no other accessories included. Windows 8 (64-bit) is preinstalled on the Pavilion. Since a Windows DVD is not included, it is advisable to create recovery media (DVDs or a USB flash drive). 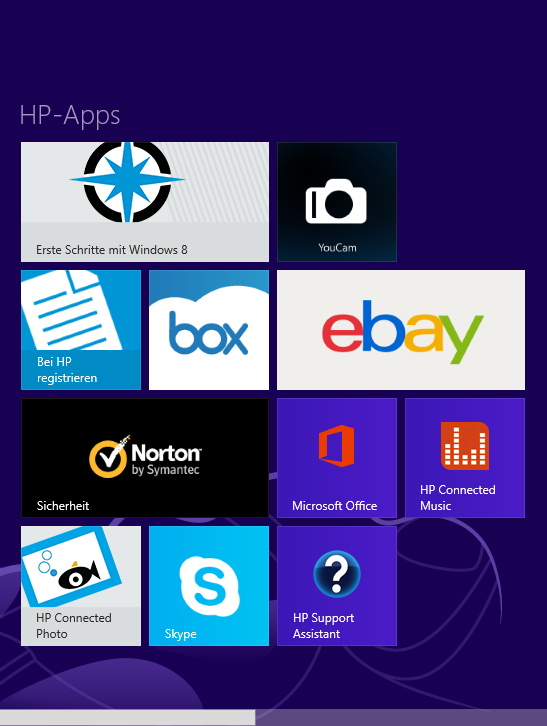 The HP Recovery Manager is installed for this purpose. Such media make re-installing the system easy after replacing the hard drive, for example. 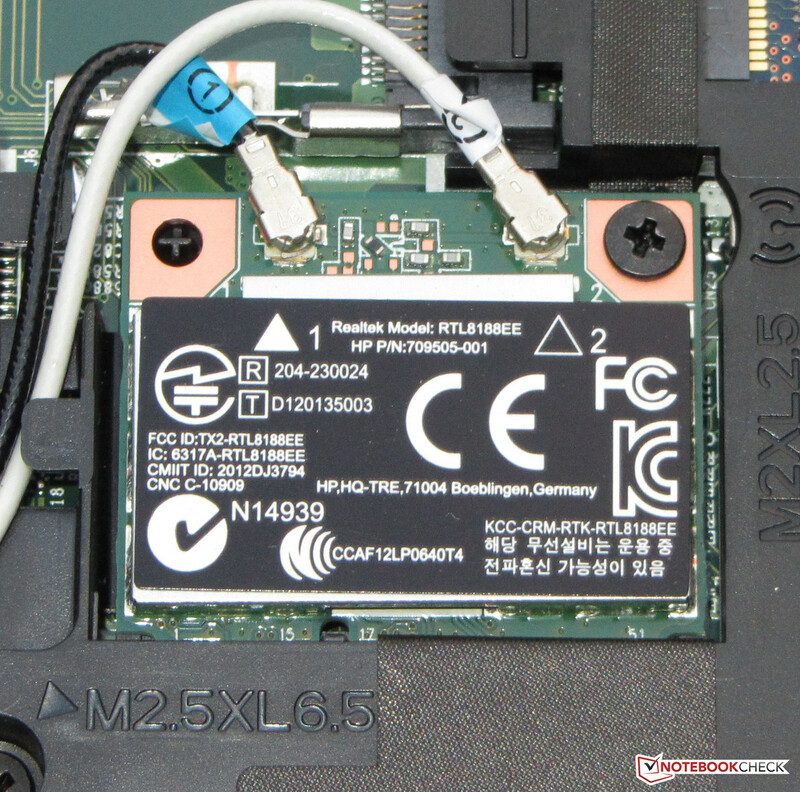 A small maintenance cover on the laptop's underside allows accessing both the working memory and the Wi-Fi module. The other hardware components can only be accessed by opening the casing. 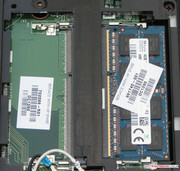 The Pavilion sports two working memory banks, one of which is furnished with a 4 GB module. 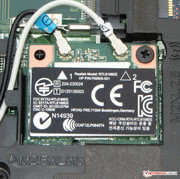 A hard drive with a height of 7 mm is installed in the laptop. We can not say whether a 9.5 mm model would fit because we did not open the casing. 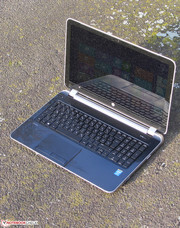 We tested a similarly slim Pavilion laptop with HP's Pavilion Sleekbook 15-b004sg a few months ago. Opening the casing proved to be a very tedious matter with a high risk of damage. Therefore, we did not make any attempts to open the casing of this Pavilion. A 12 month warranty is included on the Pavilion and includes pick-up service. Buyers of the Aspire and G505s receive a two year warranty. Warranty upgrades for the Pavilion are available: Approximately 60 Euros (~$80) is charged for a two year warranty and 95 Euros (~$127) for three years. 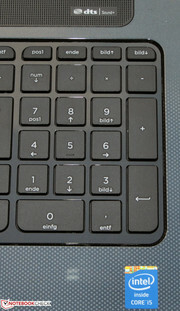 An unlit chiclet keyboard is installed in the Pavilion, and room for a number pad has also been found. 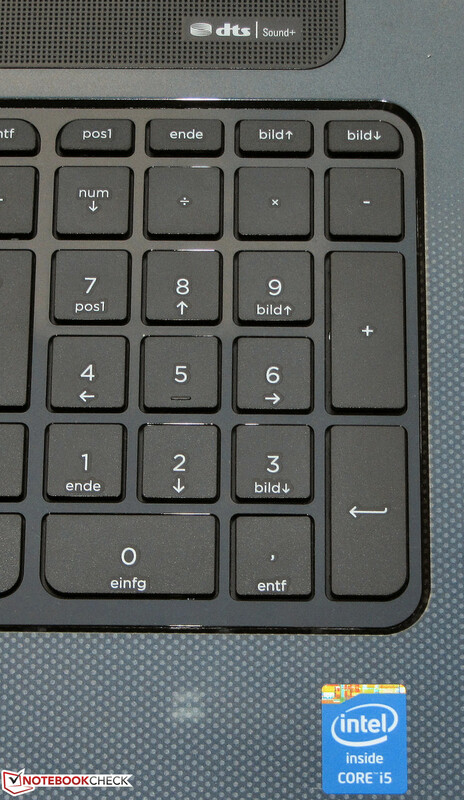 The main keys have a size of approximately 15 x 15 mm. All keys are even and slightly roughened. They generally feature a short drop and clear pressure point; only their resistance could be a bit higher. The roughly 10.9 x 5.1 cm, multi-touch capable pad features a dotted surface that does not stop the fingers from gliding. The large area provides enough room for multi-touch gestures, which can be enabled or disabled individually in the pad's setup menu. Not all gestures are enabled by default. Both mouse keys offer a clearly audible and palpable pressure point, and a short drop. A glare-type, 15.6-inch screen has been installed in the Pavilion. It runs with a native resolution of 1366x768 pixels. 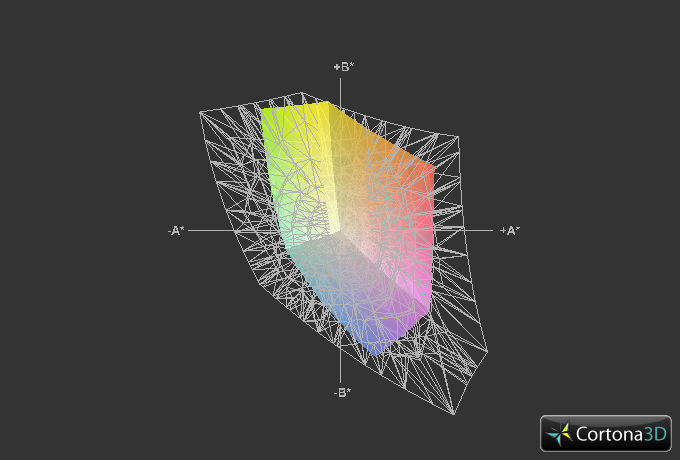 The screen's average brightness of 190.1 cd/m² is in the lower midfield. The screens in the Aspire (198.1 cd/m²) and G505s (198 cd/m²) are only marginally brighter. The screen offers very satisfactory, almost good rates with a contrast of 559:1 and black value of 0.37 cd/m². These rates are very appropriate for a laptop from this price range. Lenovo's G505s (582:1; 0.34 cd/m²) is virtually on a par. The Aspire (344:1; 0.54 cd/m²) is clearly behind its contenders. The Pavilion's screen cannot reproduce the sRGB or AdobeRGB color spaces. 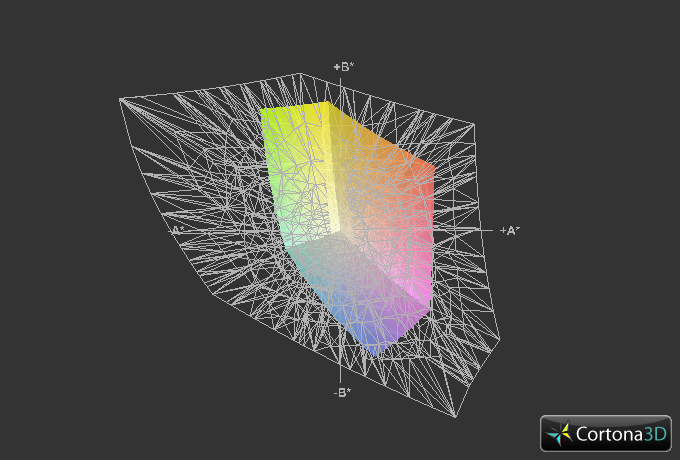 It covers the sRGB color space by almost 51%. Color spaces are important for professional image editing, for example. We assessed the screen in its default state (target color space: sRGB) and recorded an average DeltaE 2000 deviation of almost 13. No color achieves the target range of DeltaE smaller than 5. Yellow comes closest to the target range; the screen has a bluish cast. Surprisingly, content is quite legible outdoors. However, the user should try to prevent reflections. The buyer gets the usual fare in terms of viewing angle stability. The picture deteriorates quickly when the vertical viewing angle is changed. The angle is wider horizontally. HP has a basic office laptop in a 15.6-inch size in its product line with the Pavilion 15-n005sg. The Pavilion will satisfy buyers looking for a device for browsing, Skype, typing or watching videos. The laptop is currently sold for approximately 499 Euros (~$671). 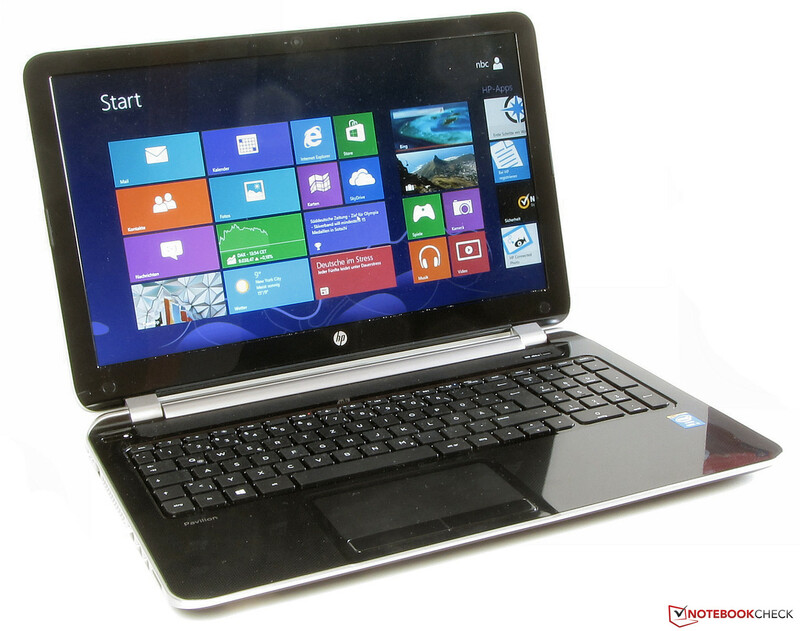 Hewlett Packard has a range of other laptops in its present Pavilion lineup - based on either AMD or Intel technology. We recently tested two other models: The Pavilion 17-e054sg (17.3-inches; AMD A10-5750M; Radeon HD 8650G + HD 8670M Dual Graphics) and the Pavilion 15-e052sg (15.6-inches; AMD A8-5550M; Radeon HD 8550G + HD 8670M Dual Graphics). The Pavilion is powered by a Core i5-4200U processor. This Haswell dual-core processor works with a base speed of 1.6 GHz. The speed can be increased to 2.3 GHz on both cores and 2.6 GHz on one core via Turbo. The processor ran the single and multi-thread test of Cinebench at full speed (2.3 GHz). A single core was also occasionally boosted to 2.6 GHz in the single-thread test. 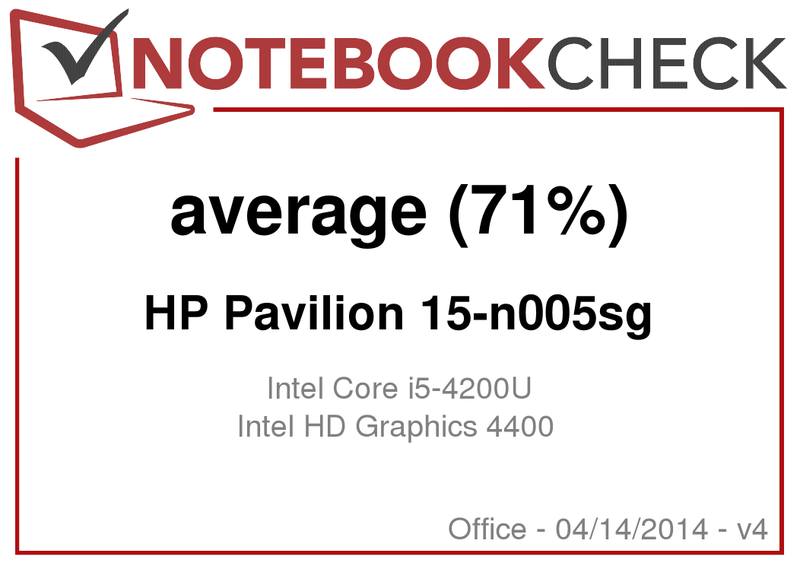 The Pavilion consistently achieved better scores than the Aspire (Core i3-4010U; HD Graphics 4400) or the G505s (AMD A10-5750M, Radeon HD 8650G + HD 8570M Dual Graphics). The CPU in HP's laptop is clearly superior to the processors in the contenders. The scores delivered by the G505s are particularly poor because the installed CPU is frequently throttled to 900 MHz. The AMD processor is quite capable of achieving scores that are very close to the ones of the Core i5 - at least in multi-thread applications. This was, for example, seen in the review of the Pavilion 17-e054sg (AMD A10-5750M; Radeon HD 8650G + HD 8670M Dual Graphics). The G505s has the lead in the GL test of Cinebench R11.5. It sports a dual-graphics solution that is superior to the Intel GPUs. The system performance is beyond reproach. It runs smoothly and does not falter. The good scores of the PCMark benchmarks confirm this impression. The Aspire (Core i3-4010U; HD Graphics 4400) and the G505s (AMD A10-5750M; Radeon HD 8650G + HD 8570M Dual Graphics) lag a bit behind the Pavilion since both laptops feature a weaker processor. A hard drive from Western Digital's Scorpio Blue series is inside the Pavilion. It has a capacity of 500 GB and spins with 5400 revolutions per minute. CrystalDiskMark recorded a read speed of 100.8 MB/s. HD Tune presented an average transfer rate of 85.3 MB/s. These rates are very acceptable and fulfill the expectations placed on a modern 5400 rpm hard drive. All in all, Western Digital delivers a solid product. 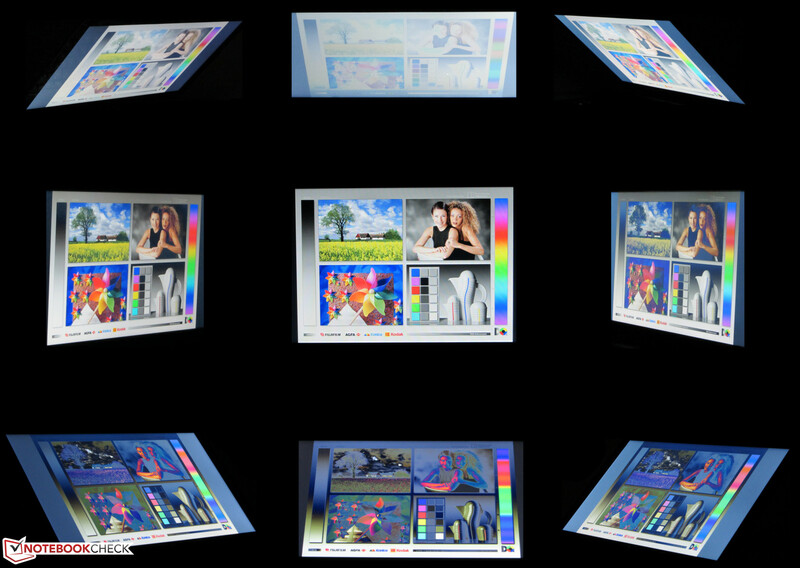 The HD Graphics 4400 GPU takes care of graphical output. The graphics core supports DirectX 11.1 and clocks with speeds ranging from 200 MHz to 1000 MHz. The G505s (AMD A10-5750M; Radeon HD 8650G + 8570M Dual Graphics) usually has the lead in the 3DMark benchmarks because it features the strongest GPU. It only falls behind the Pavilion in 3DMark Fire Storm and Cloud Gate, which is surprising. We presume that this is due to the G505s' throttling issue. 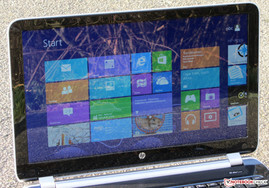 The Aspire (Core i3-4010U; HD Graphics 4400) provides poorer scores than the Pavilion although it sports the same GPU. Apparently, its GPU does not always clock at full speed. Playing on the Pavilion is still possible at a low level. Users who are satisfied with a low resolution and quality level can certainly coax smooth gameplay out of the laptop. Higher frame rates would be possible by installing a second working memory module. The memory would then run in dual-channel mode, the GPU would work more efficiently and - depending on the game - achieve up to 20% higher frame rates. We tried this on the Pavilion: We ascertained a frame rate increase in both Tomb Raider (46.3/23.4/14.9) and BioShock Infinite (32.1/17.8/15.6). Should the Pavilion's gaming performance not fulfill expectations, there are many alternatives. One would be the Aspire model with a dedicated GPU. Acer's Aspire E1-572G (Core i5-4200U, Radeon HD 8750M) renders most games well. Some retailers list the laptop for below 500 Euros (~$672) at the time of writing. This price does not include a Windows operating system. We ascertained a noise level of 31.2 to 31.7 dB in idle mode. The G505s (31.4 to 32.9 dB) is roughly on a par. The Aspire E1-572 (30 to 30.2 dB) offers better rates. The Pavilion's rates increase moderately to 34.1 dB in medium load (via 3DMark06) and 35.8 dB in full load (stress test via Prime95 and Furmark). The G505s surpasses these rates slightly with 36.6 and 37.7 dB. Again it is the Aspire that has the lowest rates with 31.3 and 32.6 dB. The Pavilion's surface temperatures were clearly below 30 °C everywhere while idling. Both the Aspire and G505s are a bit warmer. The Aspire has the lead during load. The Pavilion and G505s surpass 40 °C in some places here. Nevertheless, it is always possible to work comfortably with the Pavilion and it could even be placed on the lap. 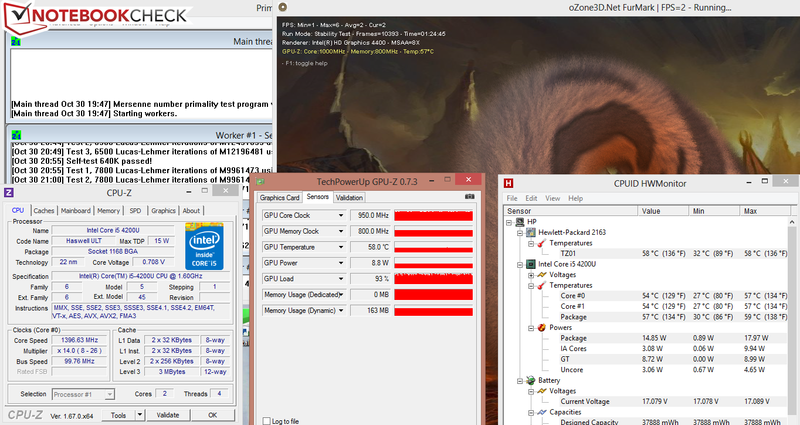 The CPU ran the stress test (Prime95 and Furmark run for at least one hour) with approximately 1.4 GHz in AC mode. The cores were occasionally throttled to 1.2 to 1.3 GHz. The GPU performed the stress test with 950 to 1000 MHz, but it was throttled to 600 MHz in battery mode. The CPU thus has a higher cooling capacity available and can consequently perform the stress test with 2.1 to 2.2 GHz in battery mode. As can be seen in our diverse benchmarks, throttling does not occur in routine use. The stress test simulates an extreme situation that will hardly ever be the case in everyday use. We reran 3DMark06 directly after the stress test and the laptop presented identical rates as in a cold state. The CPU's temperature settled to around 57 °C in AC mode. (+) The maximum temperature on the upper side is 37.3 °C / 99 F, compared to the average of 33.9 °C / 93 F, ranging from 21.2 to 62.5 °C for the class Office. The Pavilion's stereo speakers are beneath a perforated cover above the keyboard. They produce a rich sound that lacks bass. Speech is clearly intelligible. Headphones or external speakers are recommended for a better sound experience. As expected, the Pavilion proved to be very energy-efficient in idle mode. We ascertained a power consumption ranging from 4.3 to 7.3 watts. It thus consumes slightly less than the Aspire (5.6 to 9.2 watts), which also sports a Haswell ULV CPU. The G505s (10.5 to 17.5 watts) is more energy-consuming. 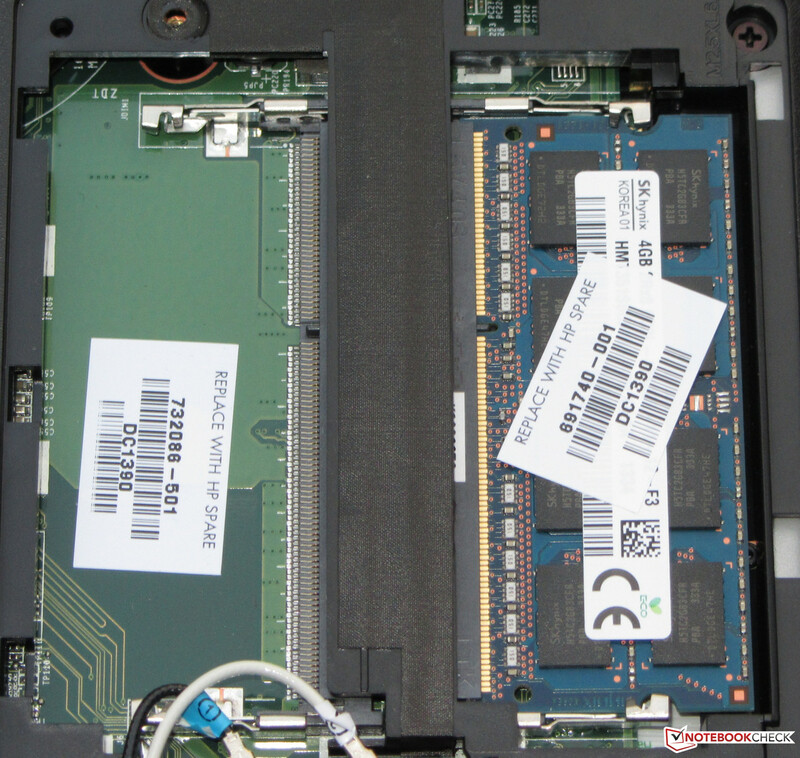 However, that is no surprise since the APU in Lenovo's laptop is a standard mobile APU (not ULV) and the laptop also features a dedicated GPU. The Pavilion consumed 25.7 watts during medium load (via 3DMark06) and 28.9 watts in full load (stress test via Prime95 and Furmark). Only the Aspire is more power-saving with 24.2 and 26 watts. The power consumption of the G505s is considerably higher with 64.6 and 70 watts for the aforementioned reasons. The Pavilion achieved an idle runtime of 10:04 h. The Aspire (6:22 h) and G505s (5:56 h) lag far behind that. We use Battery Eater's Reader's test to ascertain the idle runtime. The screen is set to minimum brightness, energy-savings mode is enabled and the wireless modules are disabled. The Pavilion lasted for 1:38 h during load and is on a par with the Aspire (1:31 h); the G505s is drained sooner (0.47 h). The load runtime is ascertained via Battery Eater's Classic test using maximum screen brightness, the high-performance profile and enabled wireless modules. 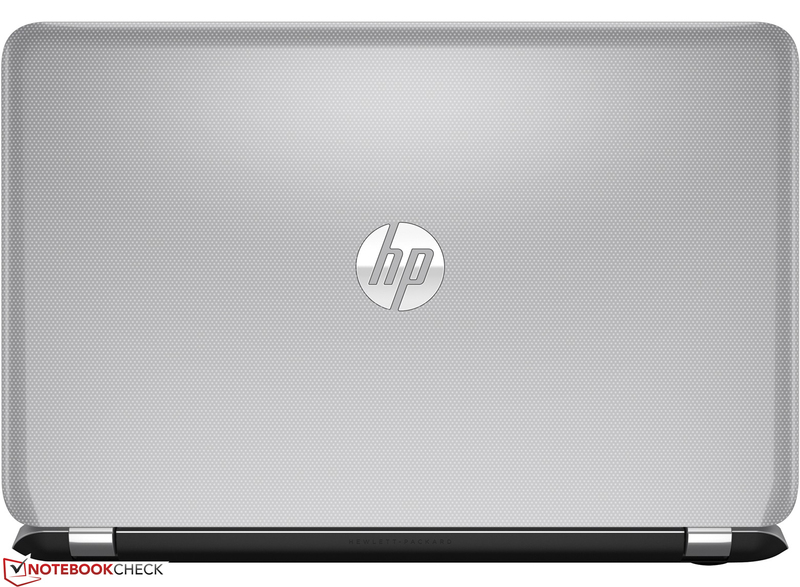 HP's laptop shut down after 4:50 h in our Wi-Fi test and again scores better than both the G505s (3:08 h) and the Aspire (3:55 h). We performed the test with the latter using an Ethernet connection due to a defect. Websites are opened every 40 seconds, the energy-saving profile is enabled and the screen's brightness is set to approximately 150 cd/m² for the Wi-Fi test. The Pavilion stopped DVD playback after 3:47 h, which is again longer than both the G505s (2:51 h) and the Aspire (2.48 h). The DVD test is performed using enabled energy-savings mode (or a higher profile should the DVD not run smoothly), maximum screen brightness and disabled wireless modules. The Pavilion's low idle power consumption leads to good battery runtimes. It is surprising that the Aspire lags far behind the Pavilion seeing that it also sports a Haswell ULV processor. 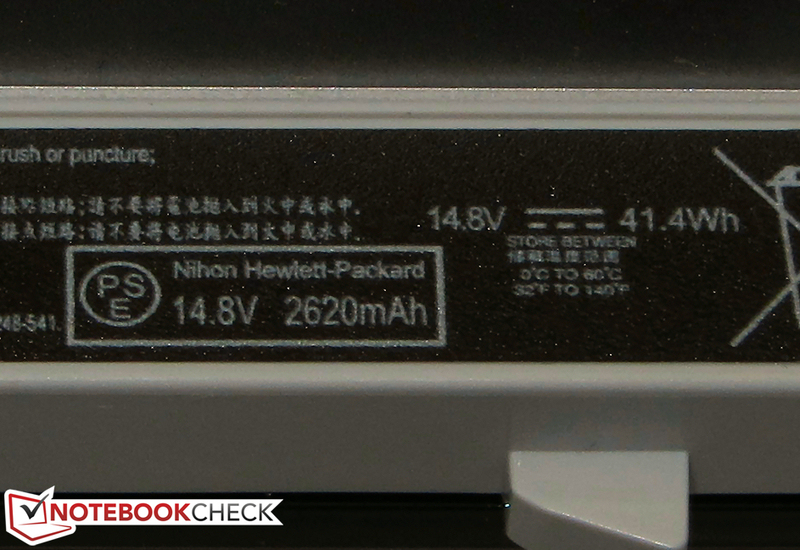 Its battery only has a marginally lower capacity than that of the Pavilion (HP and Lenovo: 41 Wh; Acer: 37 Wh). The Pavilion provides a good application performance and pleases with its low power consumption. The laptop can translate the latter into appealing battery runtimes. It also always works quite quietly and its slim appearance is appealing. The somewhat dark screen with a bluish cast and poor viewing angles are points of criticism. 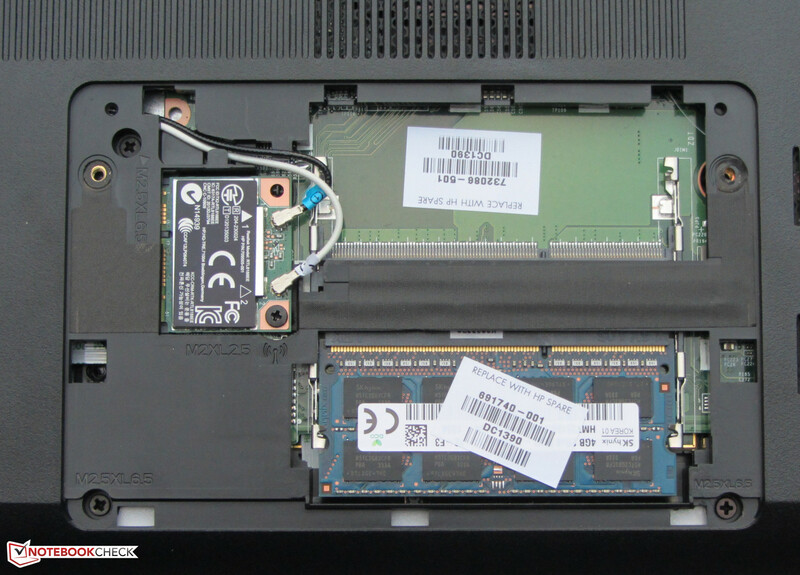 The one-year warranty is actually also no longer contemporary for a 500 Euro (~$672) laptop. 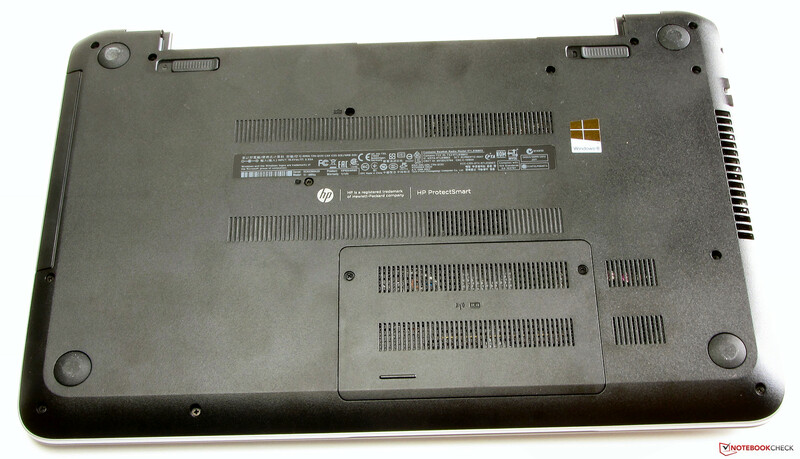 The Pavilion additionally suffers from an HP-typical affliction that we see more and more often in consumer laptops from the company: a Fast Ethernet port. This may be secondary for many buyers, but Gigabit Ethernet is today's standard - even in the budget sector. The Aspire E1-572 is suitable for all users who are interested in a matte screen and/or a Full HD resolution. Lenovo's G505s does not really have any advantages in comparison with the Pavilion. The laptop only achieves smooth frame rates in a few games despite its dual-graphics solution. Users who do not need a dual-graphics or a Windows operating system, and are also satisfied with another APU (A8-4500M) can find the G505s for prices starting at 349 Euros (~$469). We do not want to leave the latest Aldi laptop unmentioned as another alternative to the Pavilion. The Touch 300/Akoya S6212T (Core i3-4010U, HD Graphics 4400) is on the same price level as the Pavilion but has more to offer. For example, it achieves even better battery runtimes, includes a three-year warranty, features a modular bay (for an additional battery, a second hard drive or a DVD drive) and a touchscreen that can be rotated by 300 degrees. ...have a firm grip on the lid. There is only a small maintenance compartment. ...and provides a capacity of 41 Wh. ...and generates a power output of 65 watts. 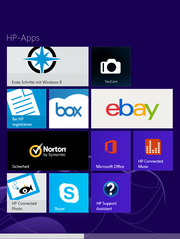 Hewlett Packard includes diverse apps. The decent application performance and the low power consumption. A brighter screen and easier access to the hard drive. 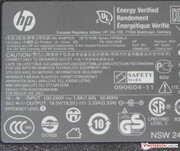 Hewlett Packard only includes a one-year warranty while the competition often offers two years. Lenovo G505s, Acer Aspire E1-572, Medion Akoya S6212T, Toshiba Satellite C55-A-1D5, Asus F550DP, HP ProBook 450, Asus F550CA, HP Pavilion Sleekbook TouchSmart 15-b153sg, Samsung ATIV Book 2, Lenovo G500s-59367693, Fujitsu LifeBook AH502, Lenovo B580, Acer Aspire V5-551, Lenovo B590.